It's designed to work with all Rhino compatible renderers, and it's the perfect tool to set up overnight render jobs without scripting. but it probably works with others too. Contact your rendering engine vendor for more information. 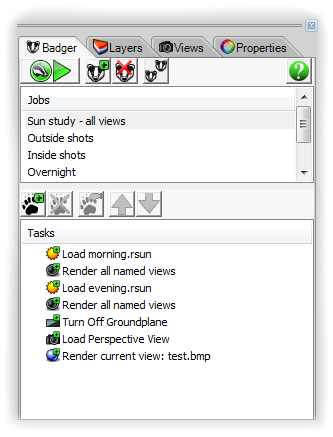 Set up multiple views, multiple layer schemes, sun positions. Render with different renderers, at different resolutions and settings. And save all of the information right in the 3dm file itself. You can download a 15 day evalution version from the download page.